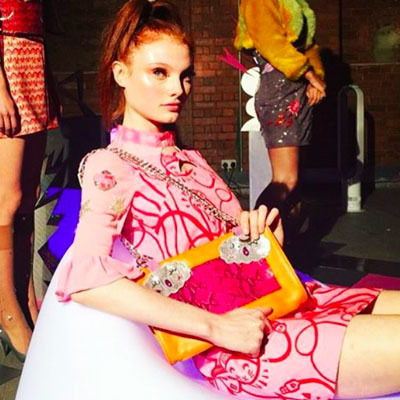 Clio Peppiatt’s recent SS16 show at London Fashion Week in Soho entitled “Kiss the Future”, was a fun collection full of bright colours and texture. Featuring an array of embroidery and sequins, Clio’s collection was inspired by feminism; a topic continuously used to fuel her inspiration. Youth culture, another reoccurring influence for Clio Peppiatt was dominant in the collection. With strong nods towards the future in outer space-inspired needlework, her aim to create unique and positive clothes that make women feel happy, bold and fearless was clear in her most current collection. 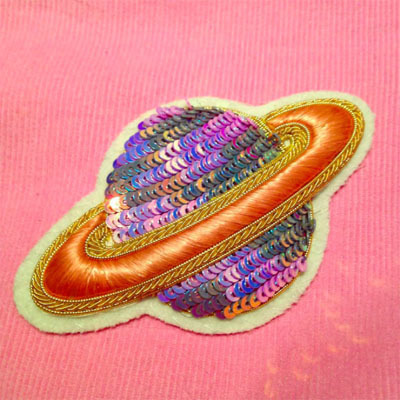 Hawthorne & Heaney were commissioned to make of a pair of Saturn planets for a baby-pink cord jacket. The badges were all hand stitched, with iridescent sequins used for the embellished centre of the planets, and a combination of satin stitch and gold work for the rings. The embroidered badges turned out beautifully and looked stunning on the pink jacket, the piece that truly represented the collection title, “Kiss the Future”. For more imagery of show, follow Clio Peppiatt on instagram: @cliopeppiatt or visit her website here.